Well, you know I am a fan of quilt books that are more than a collection of patterns. So imagine my delight at one where the patterns, at first, feel like an afterthought! Then, after a careful read, they are not. Rather, they are part of an integral whole story. Not just of the specific quilt, but of the book. Meta? Yes, I know I'm pushing it a little, but bear with me. 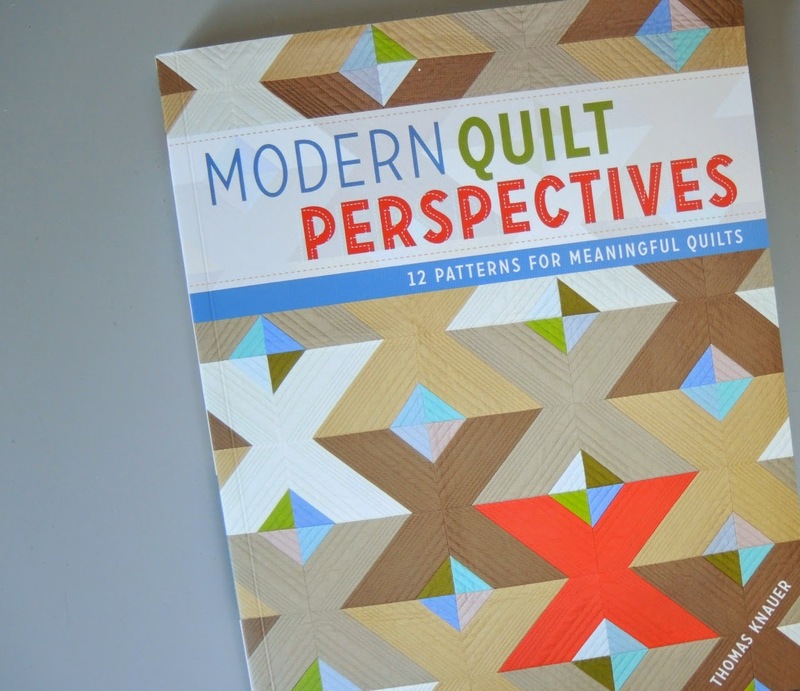 Modern Quilt Perspectives is a book about the practice of quilting more than the quilts. But in that discussion is the inherent story of a quilt. For every quilt has a story. Don't believe me? Wait for it, I will get to that. This book tackles the many reasons and themes we make quilts. Conversations, Identity, Social Commentary, and the Quilting Tradition are all tackled. Through a brief discussion; the story of each quilt; running commentary of design, technique, and decision making in quilts; and the pattern itself. Thomas Knauer reveals so much of himself in the practice of making his quilts. Central to all of these discussions is that each quilt has a story. Thomas introduces so much here. It is a structured bit of work for a guy who freely speaks his mind and isn't afraid of challenging norms. The book really is his, right down to his explanations of basic quilting tools. And the stories he tells of the quilts are emotional and vibrant. Not to mention inspiring. "The pattern is only a map, a set of guideposts along the way to make a quilt. In many ways, a pattern is the quilt boiled down to its essentials, not just technically, but conceptually, and each remaking is an investigation of the ideas under consideration. I think of most of my patterns as a set of possibilities, the starting of a conversation about an issue, thought or world view. The specific materials you choose and the ways you might vary the pattern are responses and replies... I have come to really love the idea of quilt patterns, the idea of these quilts being made and remade in untold variations and the ways in which these quilts will become parts of people's lives." It puts into a words a completely different perspective on patterns. It isn't about recreating the quilt on the cover or the page, it is about making that quilt yours and part of your story. For sure, there are quilters who walk into a store and ask for the exact fabric on the pattern cover. Or they buy a kit. But you know what? That's their story. You don't know why they need it to be perfectly matched, they may not even know. But something in the fabric, in the pattern spoke to them and they want to join the conversation. How many times have you been at a guild or retreat show and tell and someone stands up and just says, "I don't know why I chose these fabrics, I just liked them." Well, that's a story. Thomas, in Modern Quilt Perspectives, invites us to dig a little deeper into that story too. Why those fabrics? Why that pattern? What spoke to you? Find the story, even when you don't think it is there. So, this book couldn't exist without the patterns because they are indeed part of the conversation. Twelve different tangents of a long, winding conversation. And who knows where they will go? 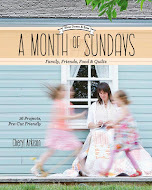 F&W, the publisher, is giving away a copy of this book to one of my readers. I was provided with a review copy for this post, part of Thomas' blog tour. Leave a comment here by midnight MST on Sunday, April 13. Tell me how often you work from patterns and kits. This is a tough question - I always draw my own patterns, but have only used a commercial pattern twice. I often get ideas from someone else's quilt then draw one with the modifications I want so I never start without something, just not true patterns. The 2 I have used made very special quilts. I often try to get the fabric to tell me how it should come together. This is sometimes hard - however when it happens it is magical. Other times I copy patterns and add modifications or changes that sometimes work and sometime don't work. It is always an adventure. True patterns are used very seldom. I never buy kits, always thinking I have at least half the fabric I want to use in my stash.. And I probably work from patterns about 25% of the time. I tend to see a Quilt for inspiration, tweak it and do the math myself. I'm strange I actually like the math part. Love the various bloggers comments about this book I need to read it! I look at patterns and may use the same measurements or techniques, but virtually never the same ranges of fabric color, patterns or texture. Kits, not at all, but I have enjoyed using a few charm packs as a jumping off point. I prefer not to work from a kit because I like to have more creative control than that! I love working from patterns (or figuring out a pattern an interpreting it) but I often don't follow the pattern I jump off on my own! Interesting stuff! I always love the thought process that goes into designing a quilt! I'd love to win a copy of the book! I have never worked from a kit. I generally use patterns but my latest quilts have just been very simple patchwork ones. I'm peering into the deep end of improv and hoping to either dive in or get pushed. My inspiration starts with a pattern or something I see. But I always put my own spin on it. This seems like a fun quilt book to read. Thank you for the giveaway! I am unapologetically happy to use the patterns of artists and designers and adapt them to my needs and preferences! I always use patterns as I'm not good enough to design my own quilts. I love using kits and patterns, and I appreciate the affirmation of that in your post. I know the result is going to be something I like and appreciate. Using my own designs and fabric choices entails more risk: both my most loved and most hated quilts are the result of my own design efforts. Sometimes I want to take that risk, and sometimes I just want to sew something pretty. I'm relatively new to this quilting thing, so patterns are a welcome safety net; learning new things and avoiding frustrating errors. I've become more confident in fabric selection and have started taking more risks lately, but with smaller projects. I've never put together a kit, but patterns are a different story. I've often started with one, but it seems as if I'm congenitally unable to follow a pattern as written. It's strange, because I wouldn't choose to make the pattern if I didn't really like it, but at some point those little "tweaks" start creeping in. Thanks for the chance to win this wonderful book. I've been wanting to read it. As time goes on I'm working less and less from patterns.....I use quilts I see on blogs or in books for inspiration then put my own slant on it. One quilt I saw at a show was in kit form and I bought it because my husband loved it and another kit I bought I altered so much i needed extra fabric so I'm not going to do that again. I follow patterns sometimes, and other times I come up with my own. I've considered buying kits when I've fallen in love with the fabric and the pattern, and it makes sense from a cost point of view to do that, but something always holds me back from that final purchase (I guess that's part of my story right there). I'm a big fan of Thomas and have even collaborated with one of the quilts in his book, so I would love to win a copy of it. I love the process of making a quilt! First of all, I don't use patterns or kits--do admit a pattern can be an inspiration and a point of departure on the way to making it my own. Almost always start with a concept and/or design--the fabric choices follow. I don't use kits at all, but I do use patterns sometimes. 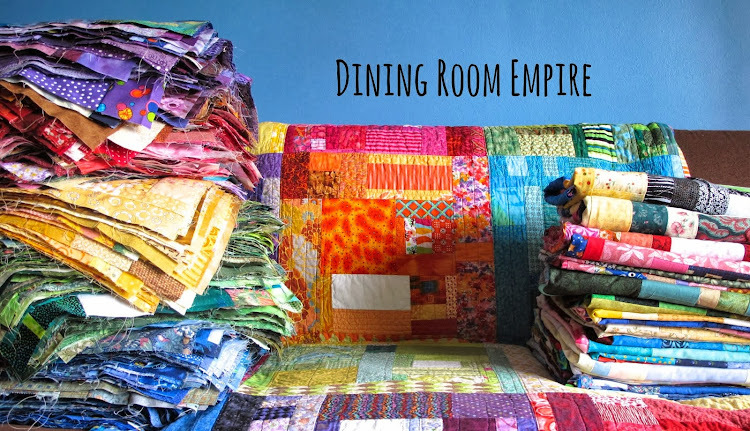 In my 40+ years as a quilter I have tried just about everything! From graph paper drawings, to sand paper templates then on to plastic and then free cutting with no templates! I think it is important to try all sorts of processes/methods and then find what suits you best. I do see a purpose for kits just like there is a purpose for jelly rolls and cake plates...they are like kits without a pattern! I'm still quite new to quilting so really need the patterns to guide my thinking. It frees me up to try something new or different or a variation. I usually use a pattern although sometimes change it to suit me. I will buy a kit it is perfect for some one or if I am traveling and I love it. I have a hard time working from patterns and kits. I usually have to change things up (my story, I guess). I did buy a kit when I first started quilting, because i wanted to work on skills without getting caught up in the other details. I didn't finish it (or should I say, I haven't finished it yet). I have never bought a kit and I asked for a particular pattern for Christmas. When I got it I thought "is that all it is?". I make my own patterns, either from an idea in my head or a photo of a quilt or something I've seen. I haven't used a kit before. I might try it in a quilt-along but free-style or patterns work best for me. I've never used a kit and find myself using patterns less and less. I'm with you. I love books with techniques. I have never used kits but have followed patterns with my own fabric choices. Just starting to play around with my own patterns. Like others I like the math and endless options of fabric choice. On occasion I use a pattern. 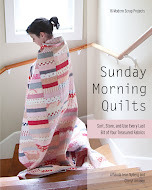 Hi Cheryl, i have never bought a quilt, not a pattern, but have gotten inspiration from patterns found in books (including Sunday Morning Quilts) or magazines. I usually tweak the pattern to suit my needs. I often work from patterns, but just as often, change them somehow, either in the method of construction, or the values chosen. I rarely buy a kit. This book sounds very interesting. I love that explanation of patterns! Thomas is good at putting words and explanations to things I feel, but haven't even articulated to myself. I never work with kits. choosing the fabrics is the most fun part of a project, and they are chosen slowly throughout the project as it evolves. I do use patterns now and then but rarely finish them the way the designer designed them. I have not bought a kit but I have used many patterns. I am still new at this so it helps me stay on track! I buy patterns, sometimes I try to mimic and others, I try my own spin. I don't usually buy kits because I have a huge fabric stash. When I retire from my day job and have more time to play, I would like to explore and design my own quilts/patterns. I followed a pattern via a "quilt-a-long" for my first quilt; my 2nd quilt I made up based on one I saw online. I think I need a pattern/kit until I become more confident. This is very interesting and I will have to read this book. I like quilting books but mostly for inspiration. If I need a technical skill, I will follow instructions until I am bored and want to do something else. Most of my quilts are inspired by others, but vary a little or a lot. I rarely follow instructions to the letter. Thanks for your fab book review Cheryl. I have the book sitting out in my garage airing out a bit (I am very sensitive to a lot of chemicals and need it to off gas somewhat). I can't wait to read it, especially after your review. I work improvisationally, have never used a pattern. I read quilting blogs and bought books and magazines for 2 or 3 years before jumping in though. I really appreciate all of the inspiration I've received from you and other bloggers! Thanks! I have never sewn from a kit.... yet. But, I have sewn from patterns with my own fabric choices. I have done one quilt along that I really enjoyed and we all did the same wall hanging. I like thinking about the person, the situation, and letting the quilt pattern feel right. I don't know what that really means, it's intuitive. Patterns are nice though because I can think about other aspects of the quilt. I am greatly looking forward to reading Thomas' book and thank you for the awesome chance to win it! I don't purchase many patterns and fewer kits. My inspiration comes from pictures of quilts that I see, traditional patterns and the fabrics that jump off the shelves and say "take me home". The patterns that I do use are often not followed to the letter, but tweaked and changed to make them mine. Thanks for the opportunity to win a copy of Thomas' book. I haven't made any quilts from kits yet, but I have bought a few just because I liked them and I intend to use them as "cruise control" sewing when I feel like making something but don't have a lot of original creative energy to put into it. I use patterns much as thy are described in the book you're reviewing, as a starting point for making my own version of something. Thanks for the giveaway! I often use patterns for inspiration but rarely follow them when I get started. I think the design and/or fabric catch my eye and help get the creative juices going. I think I will still buy this book if I'm not lucky enough to win. I have yet to use a pattern or purchase a kit. I spend hours looking for inspiration and ideas but when the rotary cutter meets the fabric it's all improv all the way frequently not knowing the end until well past the middle !~! Sometimes I use a pattern, sometimes I use bits and pieces from different patrerns, sometimes I draw my own. I never buy a kit though. I haven't used kits but I do use patterns. Often I modify the pattern with a change to a block design or a layout. I always pick my own fabrics as that is half the fun! I also design my own patterns. I don't use kits, but sometimes use patterns. I did a quilt kit once. When I started quilting and I was afraid of color and mixing fabrics. I shy away from them now because I don't want my quilt to look exactly like everyone elses. I use patterns but I don't make them look like the cover. I always try to make them my own. Whether it's thru the use of fabric, scale, or composition. I have used both patterns and kits. However, more and more, as I have organized my scraps into a usable system...I am seeing pictures of quilts as possibilities and then playing with the ideas to create my own quilts. Some of those ideas have come from your books and blog. Thank you for all that you do. I started thinking about your comments and the question you put out there. Currently I am subscribed to two block of the month clubs. One is where the pattern and fabric is chosen and the other just the pattern is provided. I'll have to say that I am more satisfied with being able to choose the fabric. But I'm nost happy about a simple nine patch quilt I made about a year ago using scraps. Not sure what that all means. Not a kit user, don't really like them, don't want to make something a bunch of other people will make. I have used patterns from books. A lot of time it's so great to get inspiration from a pattern and do what I like from it. I have not yet used a kit and only followed a pattern once or twice. I like to see a quilt and make something similar, or come up with my own improv idea. I never use patterns, but I copy the quilts that I love, putting my own stamp on them. Works for me! I pretty much just riff off of something that inspires me, be it a quilt on Pinterest or a fabric or a shape. I've never bought a kit - one of the reasons I quilt is to use scrap and vintage fabrics. I love the story part, and the math bits stretch my brain (patterns would take that away). So far, since I started last September, I've only used one pattern and no kits. I've kind of went by the seat of my pants and worked with what I've got. It is fun, I did have some trouble with the pattern but worked it out in the end. Hopefully, I'll get better! Thanks for the giveaway! I don't use kits but I most certainly need a pattern to ease my pieceing process. A pattern simply removes a big stress for me - quilting shouldn't be stressful! I have never used a kit and only used a pattern twice and both times tweaked it to suit my vision of how it should look with my fabric choices. I sometimes will buy patterns, but mostly I just wing it and see whereit takes me. Blog land provides such inspiration. I use patterns and sometimes kits far more than I would like to admit. I usually change up the fabric but not always. I'm often drawn to patterns because of the colours used in the originals. I would like to stretch a bit and try to quit more without patterns. I think the 3rd quilt I made was from my own head...and I really loved the process so maybe I'll go there a little bit more. I've used a few patterns, but I always change something up to make them suit me better. I want to put my own unique stamp on what I do. And there is nothing like a pattern to do the math for me regarding yardage. Thanks for sharing a copy of the book with one of your blog followers. I work from patterns most. I've only used a kit a few times because I love choosing my own colors. My first two quilts I used patterns, and for my first "modern" quilt I used a kit. But since then I have gotten the ideas for my quilts from other quilts I have seen on blogs or in books or in real life and just winged it. Somehow I feel that using a kit is "cheating"...maybe cheating myself out of the chance to work with color and design the quilt on my own! I often adapt patterns to a modern twist--change the scale, use improv piecing, etc. Would love to read this book! Thanks for a great book review! I am a new quilter so my first 3 quilts have been from patterns. However, as I gain more confidence I'm using patterns as more of a template and tweaking to suit my needs. But I love the comfort of a pattern, and I haven't stopped buying quilting books! I usually work from something that I have seen. so, the pattern is in my head if not on paper. (like usually an easier simpler version). I usually work from an idea I saw--on a blog, in a book, where ever--and try to figure it out myself. I've never bought a kit or a pattern. Sometimes I am tempted, but then I think that it is pretty straight forward and I could just figure it out. I don't buy kits, but am so inspired by patterns that I see. Ive bought knitting and crochet patterns, but not so far bought patchwork patterns, although lots of books about them! Im also inspired by others colour and design choices, its like brain storming seeing blogs, links, magazine articles and of course books, so unconsciously I think I absorb and then interpret from what I see. I'm just starting out, so basic squares is it for me! 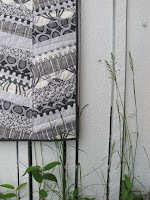 I love the idea of free wheeling and scrap quilts, hoever. I have never used a kit as I like the process of choosing fabric according to who I am making the quilt for. I sometimes use a pattern, but do the math myself and usually make templates for applique myself. The quilts I have loved the most are the ones that incorporate a little or a lot of applique. I almost exclusively work from patterns, but not kits. Thanks for the opportunity to win this awesome book! I almost always work with a pattern, but about the only time I work with kits is when I do BOM's. I find a pattern that I love and then add the color choices that speak to me. I work more from patterns now than I ever have in the past. I'm sure it's not anything more than a change in lifestyle and one day I may go back to "freestyle". I've used kits and patterns too. However, my favorite quilt that I made was from fabrics that chose on my own and a block that I made up. I think it is lack of confidence that holds me back sometimes. I'm getting there though! The one time I bought a kit because I really liked the fabric and they didn't have any bolts left, I didn't even use the pattern. I like thinking up my patterns myself. I have bought 2 kits at the very beginning. It kinda helped so I learned the technical parts and didn't feel SO overwhelmed by picking what I wanted to do (when I wanted to do everything!). Thanks for the chance to win.